I’m not sure what I need to write right now, so I am just going to let my fingers do what they do and see what comes out the other end…. This is my fourth round of the 12wbt. I began the journey in the preseason, in January 2012. The round itself started February 13th. Each round I have learned more. About the program, about the numbers, about other members, and most of all, about myself. Without a doubt, this journey has been one of the most challenging I have ever embarked upon. Also without a doubt, if I had the choice to begin it again or continue the life I had, I would unquestioningly choose to do it all over again. I have achieved some amazing things in the past 10 months. I have dropped 31kg. An awesome number. I’m sure if I even thought about lifting that amount of weight I would find it difficult, possibly even downright impossible! I know that I have a LOT more to still get rid of. Over 100kg in fact. But you know what? I don’t care about the numbers any more. I KNOW that I can do this. And even more than that, it is about so much MORE than the numbers now. It is about the rest of my life. It is about all the little things that I have achieved. It is about everything that I have to gain. I have been working regularly with my own PT since the beginning of round 2 in May. I began this process with 1 half hour session per week and I now do 2 hour long sessions per week. I have attended outdoor bootcamp style training sessions with my local 12wbt group, which was a huge achievement for me at the beginning. This is an amazing group of supportive women and I am extremely grateful for all of their support! I have climbed some of the historic 1000 steps in Melbourne. Another HUGE achievement. I have met some amazingly inspiring, supportive women who are complete rockstars in their own right! I have done wall sits and pushups (modified), two things I have previously thought completely impossible! I now recognise and acknowledge my worth. I am worthy, simply because I live and breathe. 3 rounds and 2 weeks. This list is probably not exhaustive. If I spoke with some of the other 12wbters I would likely be reminded of more things I have achieved and that need to be included in the list. Looking at the list written like this, it looks pretty impressive, right? Well, i’m not quite done yet. I want to keep these 2 things separate because out of everything, to me they are probably the biggest achievements I could ever have made. I am getting emotional just thinking about them, and I will admit to having tears in my eyes as I type. This is THAT huge! For the longest time I have been probably one of the most sedentary people in the country. Possibly not THE most sedentary, but certainly up there. I am talking for at least the last 15 to 20 years. Outside of work/university, I would mostly sit in my house and not do much of anything. And while I was not doing much of anything, I would be gorging myself silly on probably the most unhealthy foods imaginable. And this is no exaggeration. Every single day was a repeat of the previous one. Sit in front of the television and numb myself with the unhealthiest of unhealthy foods. Since beginning the 12wbt I have been struggling with these on a daily basis. This is what the “falling off the wagon” reference was about on the list above. I would return to these old eating habits. Regularly. In an attempt to numb the emotions that were bubbling to the surface. I had this crazy belief that my emotions were unimportant, insignificant, and that I was not allowed to express them. Half a lifetime of insidious, emotional abuse will do that to you. I know that sounds harsh, but that is what it was. Emotional abuse. It pains me now (and once again I am getting emotional about it) to even vocalise those two words. For the longest time I have denied it. Believed that I was somehow at fault, that I was unimportant and unworthy of being loved. And it is only now, right now, as I type these words, that I can acknowledge it. It breaks my heart to even think that *I* could have grown up in a household that had abuse in it. I have always thought – always – that my childhood was normal. It breaks my heart. Truly it does. I have tears streaming down my face as I type. It breaks my heart to think that my siblings will read this and be hurt by my words. But it’s true. It saddens me to even consider that it is true, but it is. I was raised with emotional abuse in my life. I feel like I am try to justify it by saying that things were not always abusive. As a family we had a lot of good times, fun times, happy times. As an individual I had those things. But one does not get to well over 200kg without there being issues. Enough said on this for a bit. Before all this started pouring out of my fingers I was about to discuss to of my biggest accomplishments. As I mentioned, my life used to consist (outside of work/uni) almost entirely of sitting in front of the TV numbing myself with food. Attempting to break that cycle of self abuse has been THE most challenging aspect of my ENTIRE journey! For almost 3 rounds I have repeatedly fallen over and returned to old habits, turning back to chocolate, potato chips, and a whole host of other fatty, unhealthy foods. At times it has taken me a while to pick myself up and get back on track. A lot of times. Over and over again. And every time it happens, picking myself up becomes a little quicker and a little easier. Because I now *get* that I am worthy of being cared for. Of being loved. Of loving myself. So, my accomplishment is this. For an entire month now, I have had barely a mouthful of any food that would even be remotely considered junk! And not one crumb within the last 2 weeks. I have not gorged myself, I have not binged. I have eaten only healthy food. Once again I find myself getting emotional as I type, as I consider how HUGE an achievement this is for me! Probably THE biggest thing I have accomplished. P.S. I wrote the title before I started typing the post and considered changing it with the change of direction, and have decided to leave it as it is. Despite the heaviness of some of this post, it has been somewhat cleansing for me and for the first time in a long time, I feel somehow freer. I’ve had an interesting few weeks with a lot happening. In previous posts recently I have talked a lot about how the numbers have been messing with my head. Or more accurately, I have allowed them inside and to create a bit of a mess in there. 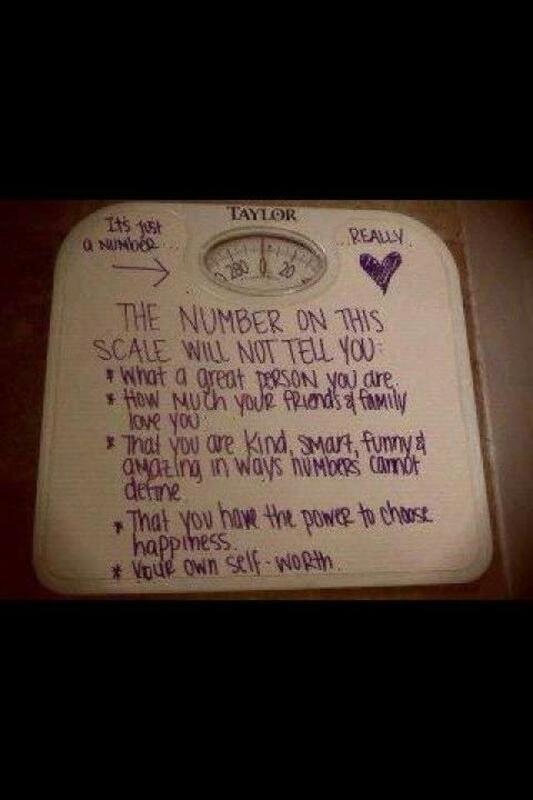 I know that the numbers on the scales are only a very small representation of the journey. All they do is report on how much mass we have in any given moment. Measurements are exactly the same. A very small part of the journey. Neither define who we are or what we are worth. I support many people, particularly in the 30+ crew, to let go of the need to be attached to the numbers and to focus on other, more important things. Tangible things such as fitness improvements, the feeling of looser clothing, increased energy, the feeling of greater wellbeing, the ability to keep up with others, new friendships, the pride that comes with achieving milestones outside your comfort zone. The list is endless. I help these people release their attachment to the numbers, and yet *I* remain attached. At least partially. From the beginning of my 12wbt journey I have been a daily (and sometimes twice daily) weigher. I don’t think I was conscious of why I did this at the beginning, it was more the novelty of having brand new scales that I “could” use (i.e., that went up high enough to hold me). The excitement was watching the numbers decrease and I allowed it to become a habit. That said, I learned a lot about how my body works. How it reacts to different things (such as sodium), how all this increased fluid retention impacts on it, when it retains fluid (time of day, week and month) and so on. That awareness has helped me to change some of my habits. Unfortunately, I became attached to the numbers. Maybe, just maybe, given what I have learned from it, this attachment hasn’t been such a bad thing. But now they are preventing me from getting to the place I want to be. I developed the NEED to have the numbers moving in a downward fashion. And when they didn’t, I became even more invested in seeing them move. Over the 3 rounds of the 12WBT that I have completed, I have donated a total of 31 kg. And it certainly hasn’t been plain sailing. The numbers have fluctuated quite substantially, often for weeks at a time! I have felt devastated, frustrated, like a failure, as if I couldn’t do it, that I didn’t deserve to get healthy. That 31kg just wasn’t “enough”. And yet at the same time, I know that I AM worth it. 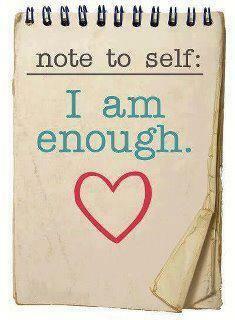 I am enough, just as I am. It’s taken me a long time to really get that, and I can say that it feels amazing to understand it at the level I now do! Which is why this headspace mess has been so frustrating. I have made some really BIG changes in my life over the last 9 months. Since January I have not consumed a drop of soft drink or flavoured milk. I have fallen over many times and returned to old nutrition and sedentary habits. And each time I have picked myself up. I am finding that the pick up happens much more quickly than it used to and the times between “falls” are becoming much longer. I have achieved things that I never thought possible. I’ve trained with Shannan Ponton, Michelle Bridges and Emazon. I’ve done personal training. I’ve pushed way outside my comfort zone and attended group workouts with other 12 weekers. My milestones in round 3 have pushed me past anything I’ve ever done before and yesterday I walked 5km (an incredibly HUGE endurance event for me)! Each of these events have helped me to realise how much I am really capable of. I now know that I can do anything that I want to do. ANYTHING! And every time I do something outside my comfort zone, I realise more and more that that I CAN trust myself and know that I can achieve what I used to think of as impossible. So what am I going to do about these scales? Every time I get on them (or do the measurements, which aren’t moving either), I send myself back into the clusters of blue noise that have been holding me back for such a long time. For weeks and even months now I have been allowing myself to get down about the numbers. While I have been so focused on them I have been allowing myself to fall into old habits with my training. The last 3 weeks or so I haven’t trained outside of my PT sessions. My nutrition has however been spot on, which is a big achievement for me, and something that I am proud of. Interestingly, other parts of my life are going really well and things are falling into place with seemingly little or no effort. Professionally I have some amazing things happening. I have helped several clients to empower themselves and make some incredibly powerful changes. I have applied for and gained entry into a Masters of Applied Psychology Program. I have had several people express their gratitude for my assistance and support during tough times. I have acknowledged a lot of positive things in my life. And yet those numbers always keep bringing me back to old ways of thinking. My brain returns to old habits. In the work I have done with both my psych and Emazon, I have learned a lot about releasing some of the things that I have been holding onto for a long time. Acknowledging that the thoughts I have are simply thoughts, that they aren’t necessarily reality, and that they can be somewhat of a separate entity. They don’t have to rule my life and prevent me from believing and trusting in myself. I don’t have to allow those thoughts to prevent me from being happy, and I get to choose where they sit in my mind. Or more accurately, where *I* sit in relation to *them*. So, I have discovered that every time I step on those scales and hear (yes, my scales speak to me) the number, it triggers a cluster of thoughts that send my brain back into old ways of behaving and thinking. And I don’t allow myself the opportunity to move forward into new ways of thinking and being. Since I have been on this program I have achieved some great things. Not just health wise, but in most areas of my life. I have learned a lot about myself, I have learned that I deserve to love and care for myself. And there is no way that I will go back to where I used to be. I am determined to continue this journey. I deserve to continue this journey. I am worthy of continuing this journey! It is for this reason that I have put my scales in the cupboard and will bring them (and the tape measure) out only on the milestone weeks for this round of the 12wbt. Weeks 4, 8 and 12. I need to give my brain enough time to break the habits and clusters that are triggered when I continuously step on them. This round of the 12wbt for me will be about trust. Pushing myself outside of my comfort zone with a variety of things to learn more about what my authentic self is able to do. Focusing on mindfulness, breathing and consistent actions that will take me closer to really knowing and understanding my authentic self. Cooking healthy meals regularly and training 5-6 times per week. Taking that leap of faith that my authentic self WILL take care of me in the way that only she knows and that I need. I have been challenged by one or two of the other 30+ crew members doing the 12wbt to do something a little different. Most people do the 12 week body transformation for a number of reasons. To “lose” weight, get fitter and healthier. But there are so many OTHER reasons. So many more important reasons. I’m not saying that reducing the numbers on the scales and gaining fitness and health are unimportant. Clearly they are. Very important in fact. A big part of the program is to push yourself out of your comfort zone. To challenge yourself, face your fears, and create the best version of yourself that you possibly can. So this challenge that has been put in front of me is to write a list of 100 reasons why I am doing this program. What am I getting out of it? For me, these have NOTHING to do with the numbers and everything to do with the rest of my life. To be able to go to amusement parks, theme parks and shows and join in the fun! To honour my mum’s life by completing the trip of a lifetime that she was unable to. To be excited about my life! 100.Because this is for ME and I deserve to live the BEST life EVER!